Buying fine jewelry can be stressful. It is usually quite expensive, but it can sometimes be a bit repetitive and dull. At Kimberly’s Jewelers, we know how boring the same kinds of fine jewelry items can be, so we have put together some excellent collections that will put a smile on your loved one’s face. High Quality Materials – All of our fine jewelry is crafted out of the finest materials. Our precious stones are carefully cared for and shaped so that they look their best and most luminous. 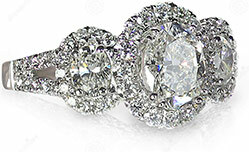 Countless Options – We have everything from platinum jewelry to all kinds of gold jewelry, including white gold. We have the finest silver, and lots of other items that you can choose from depending on your budget and taste. Great Prices – Everyone deserves the individuality of custom engagement rings or wedding band, so we work hard to keep our prices as competitive as possible. We offer many different types of payment options and payment plans to make it possible for you and your loved ones to wear the pieces you want on you special day. Fast Service – Whether you need to refit a ring or craft a piece of fine jewelry from scratch, we will do it for you as quickly as possible. We know how frustrating it is to worry about a ring not being finished in time, so we work to prevent that kind of stress. Fine jewelry is an investment. We understand that you only invest in pieces that are timeless, and that is exactly what we craft at Kimberly’s Jewelers in Fort Walton, FL. With our great prices and awesome payment options, you will be able to find the perfect piece of fine jewelry to make your loved one’s special day even better, so visit us today!